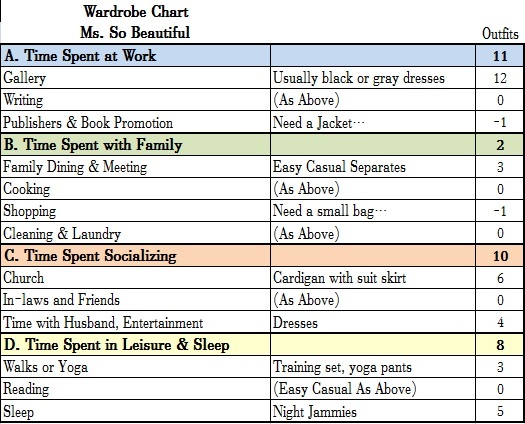 In this column, we will use some nifty charts and pies to investigate how well what you own in your wardrobes matches your lifestyle needs! What Life Cycle Are You In? Each of us has a domain that we perform in. For some of us, our current life cycle has us working mainly in our careers, with a few hours spent socializing and on fitness. Others may be focused on child rearing and working on our homes. Some are single and dividing their time at work and on a leisure pursuit. Whether our secondary domains are going on a lot of busienss trips, or getting busy with a full social calendar, or going to a church, the lifestyle may be totally varied. Your Lifestyle will include in a snapshot the various domains you are performing in, your roles and responsibilities, your whereabouts, your individual focus in life. Today, we will rely on 4 tools of assessment in 5 steps. 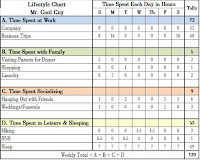 First, you will record how your time is spent in a week in a Lifestyle Chart. Second, you will create a Lifestyle Pie based on Step 1. 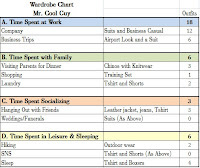 Third, you will record your Wardrobe Chart to see what is in your current wardrobe. Fourth, you will create a Wardrobe Pie based on Step 3. 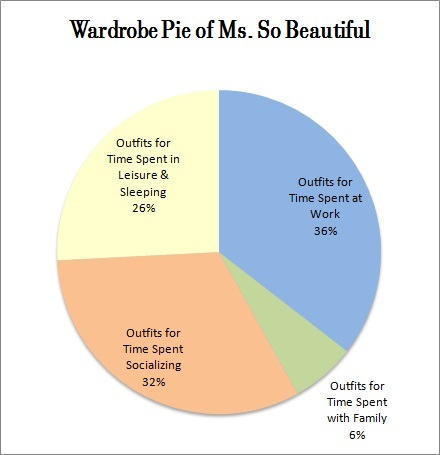 Fifth, and last, we will compare your two pies: Lifestyle VS Wardrobe! Bestselling Writer Ms. So Beautiful is a gallery owner who lives with her husband and daughter who is a teenager. She splits her time at the gallery on weekdays, and church on Sundays. Recently, there has been an increase in face to face contact with the publishers and book promoting events. Mr. Cool Guy is a globetrotting businessman in his late 40s. He loves hiking the mountains when he can. A few time a year, he goes on dates but his business being his current priority, he is not in a hurry to settle down. Lately, there have been more and more funerals to attend, with his friends' parent passing away. Step 1. Record Your Lifestyle Chart. 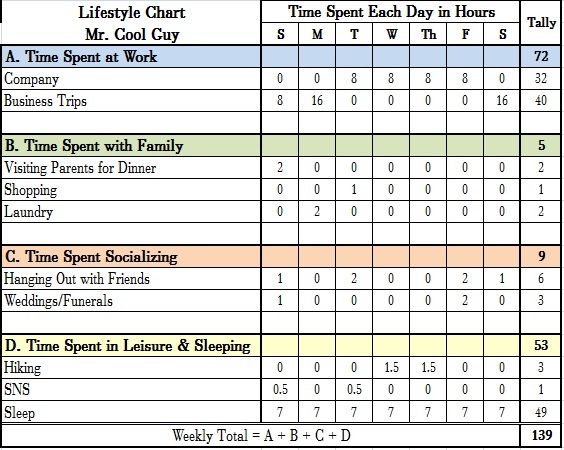 The Lifestyle Chart is composed of four domains. Record all four areas A, B, C, D and the subcatgeories with how much time you spend in each one. Then add up each category. 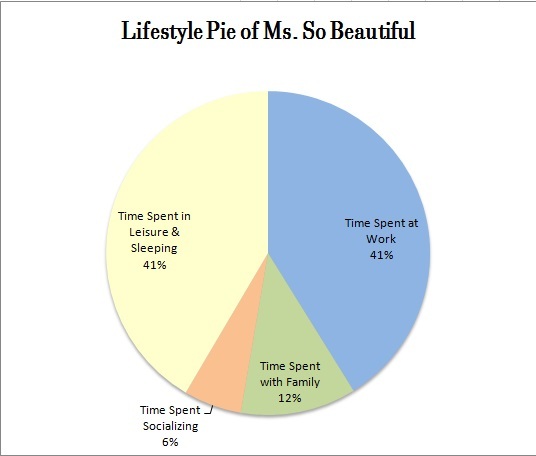 Use the four category tallies to create a small chart to be used for your Pie. Step 2. 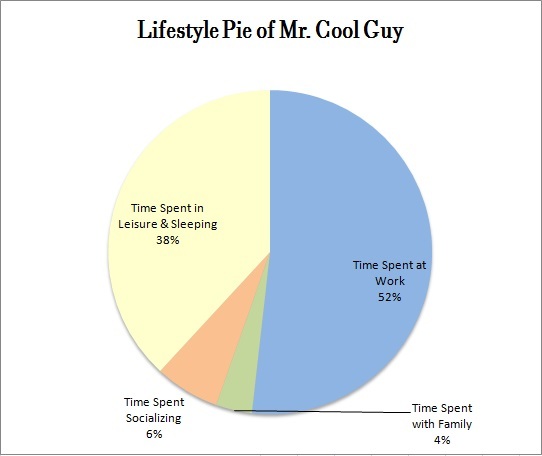 Make The Lifestyle Pie! Excel will create a Pie Chart for you if you use the numbers for A, B, C, and D. Choose the chart that shows the percentages. Step 3. Record in Your Wardrobe Chart. 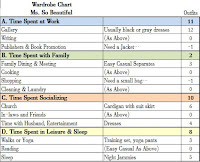 The Wardrobe Chart verifies if you have something to wear for each subcategory. For instance, if you have enough to wear to the office, how many outfits you own, if your clothes are in good condition. If you do not have something appropriate, or there is no outfit at all, you can mark it as a minus number. If the clothing is the same as another subcategory above, mark it zero. Tally up for each category. And you are all set for your next step! Step 4. Let's Make Your Wardrobe Pie! 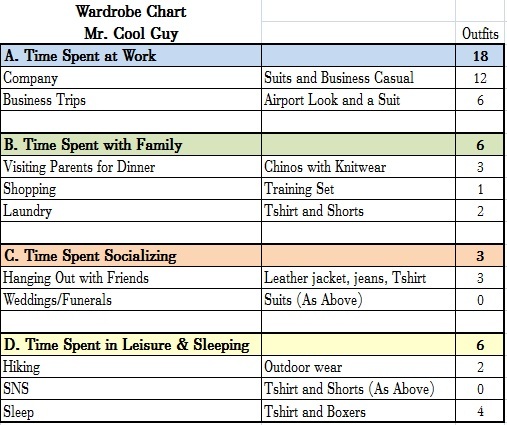 Using your category tallies from Step 3, you can click on Excel's Chart Wizard for your Wardrobe Pie. Here's our first Pie Off! Ms. So Beautiful was spending 41% of her time at her gallery and work related events, but in her wardrobe, she had 38% which means she is overall well covered with a few items missing. As she had recorded in her Wardrobe Chart, she needed something better to represent herself for meeting publishers and for book launch events. Her gallery required chic black and gray dresses for the most part, but these felt a bit heavy handed for her book related roles. On the other hand, her Social Life only required 6% of her time, but there was a whopping 32% of outfits for this subcategory! She was holding on to quite a few skirt suits for her church events, as well as dresses that she liked to buy which got worn on rare occasions in a week. Now, Ms. So Beautiful could relocate some of her skirt suits she usually wears to church and maybe get one new jacket to wear to her book promotions and publisher meetings. If not, she can always look for or invest in a beautiful scarf or a statement necklace to jazz up her work dress to wear to a book launch or meeting. Finally, Ms. Beautiful did not have big deficiencies for other categories like Family Time and Leisure, so even though the Pies are not an exact match, she does not have an urgent item, maybe except for a small bag she can take for shopping. 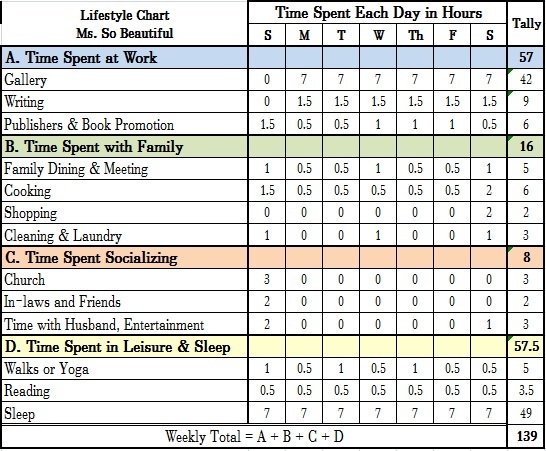 Should she decide to increase on either of the categories, it would be wise to first decrease her spendings for the Social Life category. Or find better uses of the less worn items in that category. In Mr. Cool Guy's case, he had a pretty well lined up Lifestyle & Wardrobe Pies, which shows a well justified spending. 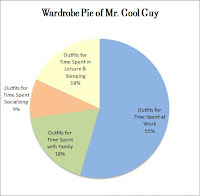 It was his Leisure category that needed some looking into, because he was spending 38% of his time in Leisure clothes, but he owned only 18% of items for this. He says that he never bothered with this category much because a Tshirt and a pair of shorts felt like enough for around the house wear. With a Tshirt and boxers for sleeping. Reversely, despite his time spent Socializing (4%), he had 18% of his outfits hanging in his wardrobe. He says that because his Mother was picky about what he wore and wearing jeans and Tshirts were not good enough for her, he ended up with these chino pants and knit wears. As Mr. Cool Guy is in his 40s, he can take a jacket from his work capsule, and pair it with a chinos. And relocate a pair or two of the chinos and the knit top for his lacking Easy Casual leisure category. This way, he can dress up a bit more for both his Mom and around the home and neighborhood. Lastly, Mr. Cool Guy owns a little excess of leather jacket and jeans looks for his Social category, and taking one or two items from this to create a new Dating Wear category with a well matched shirt or knit top will allow for a more varied outfit usage. My wish for you is that you will feel stimulated to verify whether your spendings on fashion are currently supporting all areas of your life, and for your immediate future needs. Awaken the dormant areas of your wardrobe real estate. 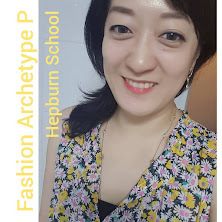 It is so easy these days to be influenced by various fashion magazines or advertisement, TV shows, because there is huge fundings spent persuading us. We're always being targeted to spend more. While buying something new is necessary and a creative way of engaging in Life, I hope you will move towards more balance and proactive use of what you already own! *The Lifestyle Pie concept comes from an author I've admired for many years, Nancy Nix-Rice, one of her books called <Looking Good>. For reader's convenience, I added in a Step 3, which seemed to be missing from the book.